We are a nation of animal lovers with millions of dog owners all across the country. Dogs are of course man’s best friend, that is until they foul in a play area or main walkway. Dog fouling is on the increase, not because we have more dogs but because dog owners are failing to bag it and bin it. 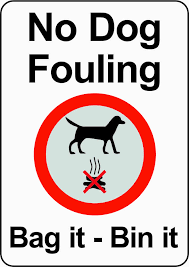 Advice from Perth and Kinross Council states – “It is an offence for any person responsible for a dog, not to immediately remove and dispose of appropriately, any excrement after their dog has fouled. This applies to any public open space including pavements, footpaths, roads, parks, recreational pitches, cycle ways, communal land, backstairs, closes, and any open land that the public has access to. Offenders may receive a Fixed Penalty of £80, rising to £100 if not paid within 28 days. It is also possible that some offenders will be reported to the Procurator Fiscal with the potential of a fine up to £500. If you are aware of any irresponsible dog owners who have failed to pick up after their dog then please let us know. or any information which might help identify the owner can prove useful . There are free dog poo bags available from the Spar and the Post Office in Auchterarder and the shops in Dunning and Blackford, so really there is no need for any dog poo to be lying about the towns. With the number of smart phones going about it is only a matter of time before those irresponsible dog owners are named and shamed, don’t let it be you. Bag it and bin it, that’s all it takes to keep the community clean and free from fouling.